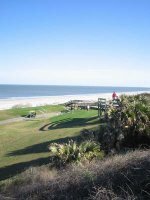 As mentioned yesterday I'm now in Florida, near Jacksonville specifically, for a conference at the Amelia Island Plantation Resort. Getting here wasn't easy though, with the weather in Chicago. It was blowing snow and freezing cold in the windy city, and we had a ground hold in Toronto for an hour before they let us take off. As the pilot explained because things were backing-up in Chicago, they wouldn't even let us take off yet, and Chicago would call back and let us know. We were told to pray for lower visibility, because apparently only United planes (we were on a 757) have an instrument landing system so if visibility was really bad they'd let us come in sooner. An hour after sitting in the plane on the tarmac though and we got the go-ahead and took off for an uneventful flight into Chicago. On the ground though the ordeal continued, as with the weather still very bad our gate wasn't free yet. So, we taxied around for awhile and eventually parked out on a far off corner of the tarmac at O'Hare, where the captain passed out granola bars. The captain was great, explaining things and joking along the way to help keep everybody somewhat sane. He said it wasn't just the visibility slowing things, it was also the extreme cold. It was causing fuel lines on the truck, dido the de-icing trucks, so crews had to cycle out of a heated hanger, slowing fueling and de-icing. Also, regulations prevent the crews from working outside in such cold for more than a certain period, so they also had to shuffle out of heated rooms. Finally though they got us a gate and expelled us into the terminal. My connecting flight was to have left, but luckily with the weather it was delayed so I had two hours to kill. Some pizza and off to the United Lounge. Much less swanky than the Air Canada lounge, no open bar, no free Internet, just comfortable chairs and cheese and crackers basically. Grabbed a seat, fired up the Ipod and began to wait. Every time I went to check the board, the flight was delayed another half hour. Finally, after a five hour delay and another wait on the plane, we were on our way to Florida. 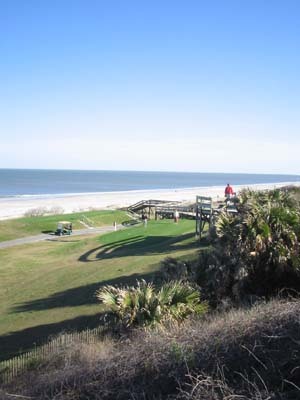 Finally made it into Jacksonville at 12:30 am, five hours later than scheduled, and out to the resort and off to sleep at 2:30 am, after ordering a 6:30 am wake-up call. 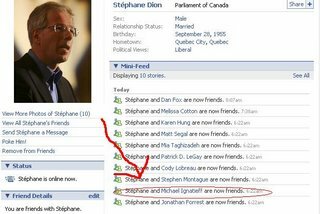 Not before checking my e-mail of course, and was surprised to see an e-mail from Facebook saying Stephane Dion had added me as a friend and in Facebook parlance asking me to confirm that, indeed, Stephane was a friend. I hadn't really thought about it before but I figured sure, Stephane is a friend, so I clicked confirm. Seriously though, good to see another sign the LPC is embracing some of the newer technologies to help get its message out. Daily Canuck had an interesting article on the role Facebook, MySpace and the like are playing in the U.S. Presidential primary race the other day. I wonder how long before we see Harper and Dion bragging about their respective friend numbers? So if you're on Facebook be sure to add Stephane as a friend. And me too if you want, although the future of Canada probably doesn't depend on the latter. In France, the two presidential candidates have set up offices in Second Life. I wonder if there is a Liberal Party of Canada office there. Hey, I'm up there too! Cool!